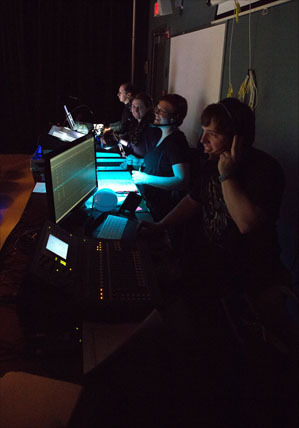 The Entertainment Production degree program is designed to educate students for career opportunities that exist in the many fields of the entertainment industry. The curriculum focuses on professional design, technology and management skills that are needed "behind the scenes", rather than on performance. Core disciplines associated with theatre and the performing arts are employed by many other communications industries throughout the world. As an example, design and construction techniques used in theatre are employed in everything from trade shows to shopping malls, fashion shows, exhibits and even political rallies. A variety of entertainment venues require professionals who can design and operate today's entertainment technologies, as well as manage events and performance facilities. Entertainment Production is a hands-on, industry-wide training program for this exciting and creative field. Our entertainment production program offers you the opportunity to pursue a concentration that best speaks to the career you have in mind. You’ll spend a lot of time in our beautiful Gracie Theatre, a state-of-the-art performance space where you’ll learn your craft and practice your skills through real-world experiences in a working theatre.